The Riverwalk at the Colorado Belle is holding many themed free festivals with live music and food and beverages sold separately. Crash Our Party Country Festival is set Friday-Sunday, April 6-8. The all new Rock’n’Ribs Festival will follow Friday-Sunday, April 13-15 with live entertainment alongside the first rib cook-off being held in the Colorado Belle Parking Lot. There will be free live music all weekend long by classic rock group Stef N Rock, Rebel Heart a Southern Rock/Modern Country act, and Beer Drinkers & Hell Raisers s ZZ Top tribute band plus retail as well as food and beverage vendors. Hours are Friday 2-11 p.m., Saturday 11 a.m.-11 p.m., and Sunday 11 a.m.-6 p.m. The 20th Annual Blues & Brews Festival is set for April 20-22. There will be free live entertainment by great blues musicians including: The Preston Shannon Band featuring Jonathan Ellison; the Chris Hiatt Band; the Charlie Tuna Band; and John Earl & the Boogie Man Band featuring Chris Tofield. There will be Pints handcrafted beer and food vendors. The John Earl & the Boogie Man Band featuring Chris Tofield will have thousands of motorcycle enthusiasts invading the town Wednesday-Saturday, April 25-28. There will be vendors, music events, bike riding, etc. The Baja Days Riverwalk Festival starts off May 4-6 with a Cinco de Mayo celebration. Jean Jeffrey The Salon and Day Spa opened at the Riverside Resort last February. This is a second location for owner Brittany Laughlin, who designed the entire spa with a waterfall behind the front desk. She has been operating a salon in Bullhead City since July 2014. If the last name is familiar, she is married to Matt Laughlin, chief operating officer of the Riverside. The pampering menu at the Riverside offers massages, body wraps, facials, hair and nail services, and more. Many of the products are vegan, organic, and free of sulfates and parabens. Riverside comp points are also redeemable for services at the salon and spa. Hours are daily 9 a.m.-6 p.m. daily. The Amateur Athletic Union (AAU) North American Weightlifting, Powerlifting, Feats of Strength/Strongman & MAS Event will have drug free athletes competing in indoor and outdoor events in men’s/women’s/youth divisions in Harrah’s Ballroom and the Rio Vista Amphitheater. Competitions are Thursday-Saturday, April 5-8. Drug free admission is $10 each day. The 21st annual Forbidden Fantasy show is a mini truck event featuring custom trucks and cars with adjustable suspension being held April 7-8 at the Mojave Crossing Event Center across from the Avi. The show ‘n’ shine welcomes the public to view the vehicles on Saturday from 10 a.m.-5 p.m. and Sunday from 9 a.m.-2 p.m. The next event at the Mojave Crossing Event Center will be the World Fighting Championships 85 on Saturday, April 14 at 7 p.m. with the show at 8 p.m. Tickets start at $30. The River Cruizers Car Show will also happen at the Mojave Crossing Event Center Friday-Saturday, April 20-21 from 9 a.m.-6 p.m. while the Chili Cook Off with music by Powerhouse happening on Saturday, April 21 from 10 a.m.-5 p.m. Five chili tastings will cost $7. The 6th Annual Meat Bingo & Western Boot Stompin’ Hoe Down presented by We Care Cancer Support, Inc. will take place Saturday, April 14 from 6 to 10 p.m. at the Bullhead Area Chamber of Commerce. The event includes dinner, beverages, no host beer and wine, and one bingo hand. Meat Bingo is played with playing cards rather that bingo balls and dauber. A game hand consists of three cards. If your three cards are drawn before anyone else’s you win meat from a selection of beef, pork, turkey, poultry, ham, seafood, etc. Game rules on every table. Also, there will be a bake raffle, 50/50, other raffles and entertainment by the Class Act Band. Tickets are $15; call 928-123-4567. The 21st Annual Gamblers Classic Corvette Run is a scheduled special event in the Riverside Resort Parking Lot Thursday-Saturday, April 19-21. This car show event is put on by Corvettes of Bakersfield. The Cinco de Mayo Celebration & Car Show will be held at the Tropicana’s Pavilion Theater and North Parking Lot Friday-Sunday, May 4-6. Throughout the weekend, the Latin inspired car show will have live music, food and dance parties. Entertainment in the Pavilion Theater will highlight “The Como La Flor Band – Selena Tribute” Friday, May 4 and Thee Midniters on Saturday, May 5. Tickets are $20 for the 8 p.m. shows. A must for every visit to the Riverside Resort is to go to the Riverview Bar to await the opening of the shades. If you are in the bar area early in the morning before 9:30 a.m. you will notice the bar area seems dark and closed in, much like the casino area itself. This is because they close the shades later in the evenings and don’t open them until the sun has risen to keep it from hitting you in the face. 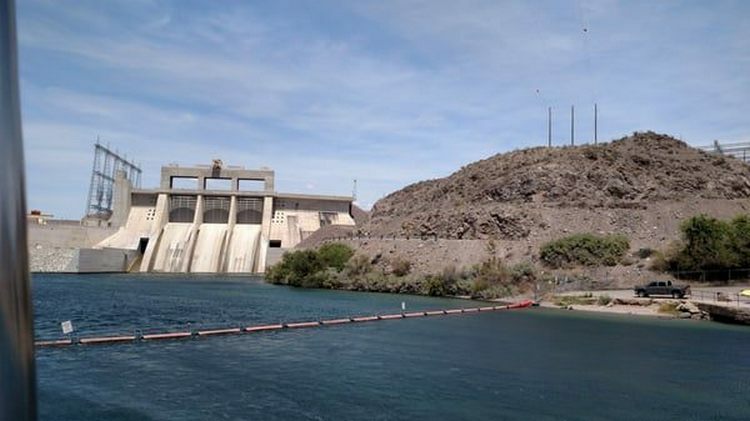 But at a preset time, usually around 10:30 a.m., all the window shades are released together to open and give you a terrific view of the Colorado River. It will almost make you feel like you are on a boat! You probably won’t see anyone else waiting for this to happen, but I think it’s pretty cool to see. Remember to have your sunglasses ready … you are forewarned! 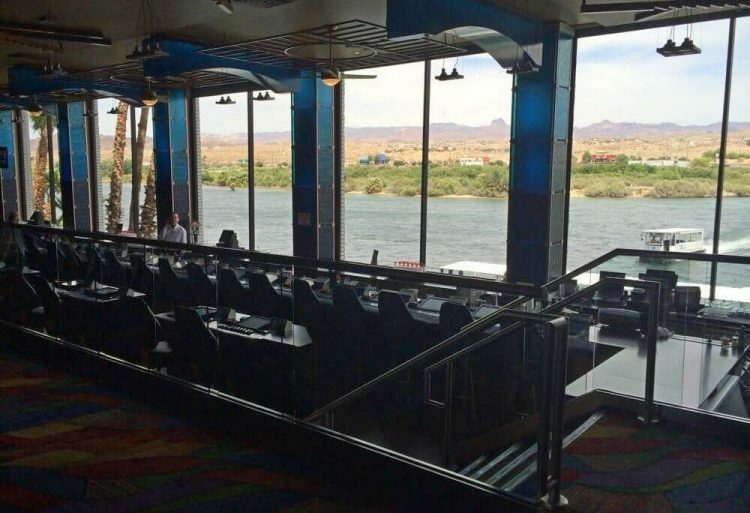 Another must is to go to the Riverview Restaurant at least once during your visit to Laughlin and ask to sit by the window. You can relax and watch the activity on the river while enjoying a meal. The restaurant is open 24 hours, with breakfast served from midnight until 2 p.m. The breakfasts are usually hearty, and their pot roast is normally exceptional. 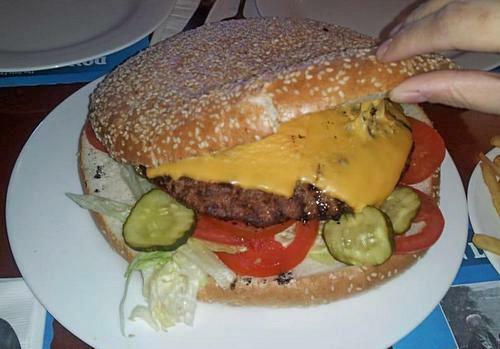 The giant ham steak special and the giant hamburger, which is 1 ¼ lbs. of meat, is outstanding … if you are a big eater. If you need to go to the King of Clubs players’ club they are open from 6 a.m. until midnight from Sunday through Thursday and are open 24 hours on Fridays and Saturdays. You should try to go early when they open to avoid the long wait. You should always get a players card when you go into a hotel with a casino. Even if you do not gamble the players card can sometimes be used for discounts for activities or dining locations of their choice. The Riverside allows discounts starting at the silver tier level, which is 25% off their buffet. Or if you are a local living in Laughlin or Las Vegas (yes, Las Vegas is considered a local in Laughlin!) they will put a Local Pride sticker on the back of your card. Make sure you ask for this! You can get a 20% discount at Cinnabon and Pizza Hut, 10% at Fatburger and The Watchman and 2 for 1 on popcorn and soda at the cinema on Tuesdays and Thursdays, plus other neat discounts. They also have a coupon sheet you should ask for which has $1.00 off the USS Riverside cruise. And, don’t forget, if you do gamble you can use your points towards meals at their restaurant and buffet. What can I say about the USS Riverside Boat Cruise? I guess a lot! 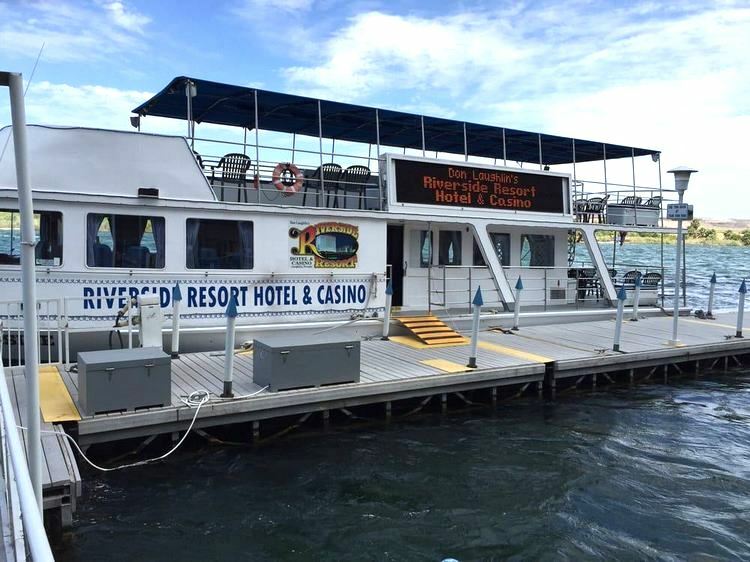 Another must for your trip is to take this 80 minute cruise on the Colorado River. This is the only boat that goes under the bridge to Davis Dam. The cruise takes you down the river also to just past Harrah’s Hotel & Casino. You have a full, slow perusal of the river-viewable hotels. They have audio giving you the history of the area, but, keep in mind that it is a dated version (the Ramada is now the Tropicana) and a bit scratchy if the speakers don’t work where you are seated. If nothing else you can just enjoy cruising on the river and can purchase drinks and snacks while onboard. The boat holds 91 passengers and does get full for some of their trip times; so, book early. They run 4 times a day Sunday through Friday and 6 times on Saturdays. There are times, like low or high water levels, when they do not cruise. Make sure you check with the ticket office. Tickets are $12 (Age 13+), $6 (Age 3-12) and free (2 yrs. & under). Also, I recommend going during the day instead of taking the sunset cruise because of the insects that swarm by the water. The boat has an interior climate-controlled area to keep you cooler if it’s hot outside and a canopy over the top of the boat. The Riverside is the start or finish of the riverwalk north to Davis Dam over the new pedestrian bridge. 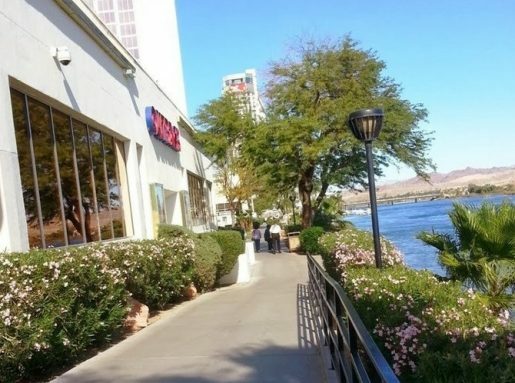 The Riverside is also at the beginning or end, depending on where you start, of the riverwalk along the back of the hotels from the Riverside to the Laughlin River Lodge, the unofficial end since there is a no trespassing sign there. For me, this is the official end since you have to climb the hill in order to get to Harrah’s, which is not an easy task. Have an RV? The Riverside RV Park is across from the hotel to the south of the Riverside Parking Garage. While the RV office is at the bottom of the hill the actual park is on top of the hill with limited green spaces. But, let’s continue out of the Riverside and on to another hotel down The Strip, the Aquarius Casino Resort, right next door. You can reach the riverwalk from the north parking lot, go down the escalator by the south side of the Riverview Bar or out from the non-smoking section into the south parking lot. A note of warning here: do not think you can get to the Aquarius by walking across the long south parking lot and imagining there might be a gate you can go through to get in. There is no gate! You will have to walk all the way back towards the Riverside to get to the riverwalk or make your way to the street, and then it’s a long walk to the Aquarius. As you traverse the riverwalk to the Aquarius there are a couple of inclines to take. Take it slow and enjoy the view. I have to say that the Riverwalk section in the back of The Aquarius is really pretty, with benches and wider spaces to view the river. You will pass the section where there are usually raccoons and/or skunks below the incline in the bushes. Look down over the rail as you go. The animals normally come out of their homes at night and can be right on the riverwalk, so, be careful at dusk and later. If you don’t happen to see them you might notice the skunk smell during the night when you are in your hotel room. This is your best indication that they are around! 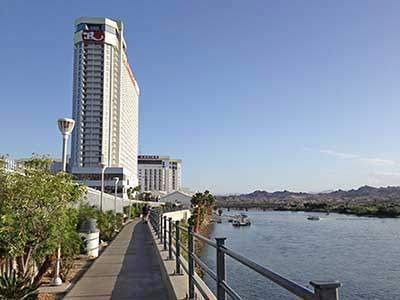 SPECIAL NOTES FOR APRIL – The 2018 Laughlin River Run is being held for the 36th year, April 25th through April 29th, which should consume all the available rooms by motorcycle enthusiasts. The prices of rooms will be extremely high if you can even get accommodations. The Rock ‘N’ Ribs Festival is April 13-15, and the 20th Annual Blues & Brews Festival is April 20-22nd. Both are held at the Colorado Belle if you want to attend a fun weekend event without the massive crowds.